Last week, Vancouver Whitecaps announced their new “Unity” jersey, a steel grey kit with a silver and black Caps logo and the traditional Adidas 3 stripes on the shoulder, also in silver. There was much speculation that it was black, much like other MLS kits that have been recently released. Although in some photographs, it comes across as black, it is most definitely not. The initial reaction to the kit was mixed, as seems to be the norm with most, if not all, strips across the league, but it seemed mostly very positive. 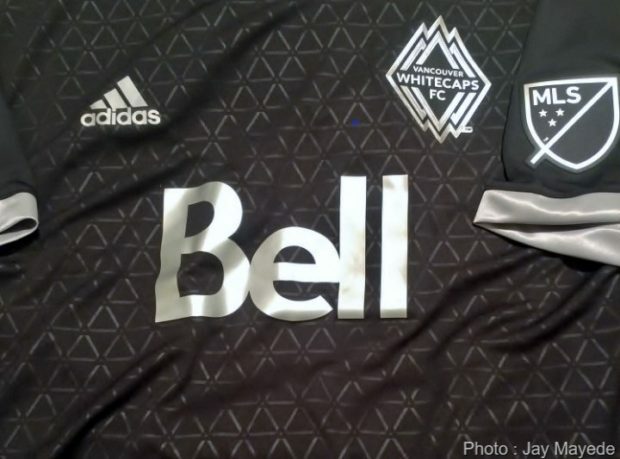 Today gave fans their first chance to pick up their own jersey, so I headed along to the Whitecaps Gastown store to do just that and to bring you a closer, first hand look. There are a definitely couple of notable features about this kit: the primarily mesh back, which should provide some additional cooling; a silver maple on the back above the name; and a small Adidas authentic patch near the bottom of the jersey. In addition to the kit, they have also released two different styles of hats in the new colours, both of the snapback variety. They had just arrived into the warehouse this morning and arrived at the Gastown store as I was paying for my jersey. I did not purchase one as I prefer the real baseball style (fitted) hat which I was told should be in by First Kick. 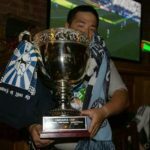 I was also told there would be a scarf as well, and for a collector like myself, well, it’s one time that I’ll make an exception. The most important thing is the fit. For a large individual like myself, sizing is an issue. In true MLS Adidas fashion, the largest size is a 2XL. I was expecting it to fit exactly like the Sea-to-Sky kit in that there wouldn’t be enough fabric to compensate for when I raise my arms above my head. Maybe I got smaller or Adidas changed the fit, but I no longer have that problem! For the crested kits, they had four players scheduled to do a signing (Kendall Waston, Efrain Juarez, Alphonso Davies and Kei Kamara). As this was the release date, there was a minimal wait for a cresting. To me, the question was always whose name did I want on my back? The obvious candidates were bandied about, but, as is my preference, I went a little off the board opting for Canadian international Marcel de Jong. Normally, I’m not one to praise the front office, but it looked as though they had plenty of stock in both men’s and women’s sizing. As for the hats, I can’t be too upset as I work in logistics and understand that they’re at the mercy of the supplier and trucking/courier company. Regardless of that fact, the jersey is the big piece and everything else is just another way to extract money from an already empty wallet. If you’re wanting to pick up your own jersey, just be aware that the authentic short sleeve sells for $129.99, with customization an additional $34.99. I’ve always loved the simplicity of a black jersey/dark grey jersey, regardless of the sport. Yeah, it’s a magnet for heat, but this one looks like there’s enough ventilation via the Adidas Climacool technology and the mesh back. Time will tell!